The Civil War was the testing ground for our democratic republic. That idea was put forth in the Gettysburg address. Many of the places where our democracy was so firmly put to the test, the battlefields in America, are being destroyed by commercialization. One such place is Gettysburg. The gaming commision of Pennsylvania is looking to build a casino one half mile from the boundaries of the National Park. This is something I think absolutely should not be done! The men who fought and died at Gettysburg didn’t do so in order that the town might be turned into ” a den of thieves.” We need to Preserve, Protect, and Defend Gettysburg. Say no to the casino! on April 29, 2011 at 9:04 am Comments Off on Say NO!! Because He died I am forgiven. Because He lives I have a better future. They’d just lost their dearest friend. All that He said, now He was dead, so this was the way it would end. The dreams they had dreamed, were not waht they’d seemed, now that He was dead and gone. The wedding, the water , the wine. Noe it wasdone, they’d taken her son. Wasted before his time. She knew it was true, she’d watched him die too, she’d heard then call Him just a man. But deep in her heart, She knew from the start. Because Christ died I am forgiven of my sins. Because He lives I have a better brighter future. The Cross looks back to my past and to Jesus’ past. The resurrection looks forward to our eternal heaven with Christ in heaven for those who are believers. When Christ died Satan thought he had won the ultimate victory. God caught Satan “off guard” when he was resurrected. He came back to life sealing the doom of Satan and bringing to us eternal life and the gaurentee that we too will be resurrected one day too. Luke 24:5-6 “Then, as they were afraid and bowed their faces to the earth, they said to them, “Why do you seek the living among the dead? 6 “He is not here, but is risen! Remember how He spoke to you when He was still in Galilee, ” He is alive! He’s not here! Glory and Honor to God! on April 24, 2011 at 11:45 am Comments Off on Then Came the Morning! This past week has been filled with anniversaries and memorials to important events in the Civil War. The 12th-14 of this month marked the 150th anniversary of the bombardment on Fort Sumter and the beginning of the Civil War. The 13th was also the day that the greatest president (in my humble, uneducated opinion) America has ever had was shot. So many things happened in such a small span of time. Who, at Fort Sumter in 61′ could possibly realize that 4 years and 600,ooo killed, missing, and wounded men later America would be the strong nation we know it as today? How many of the Confederates realized what they were doing when they fired that first shot at Fort Sumter? Did Beauregard know that as he gave the order to fire the first shot of this first battle of the war that he was ordering there to be thousands of other battles. Did he know that even though there were no deaths in this battle there would be upwards of 700,000 deaths, all Americans? Who but the Lord Almighty could have known? So many monumental things happened in the five Aprils that encompassed the Civil War. In April 1861 the Civil War began. In April of ’62 the battle of Shiloh is fought bringing to the light one of the most famous Civil War generals, Ulysses Grant. April of 1863 and 1864 brought a comparative lull in the action. At this point in both years the armies were still in winter quarters waiting for the mud to dry making the roads once again passable. April 1865 was the most action packed out of the five Aprils. It containded the fall of Richmond, the surrender of the Confederacy, and the first assasination in American history. The Civil War changed the lives of everyone it touched. According to Scott Hartwig of the blog From the Fields of Glory the Civil War “Suddenly thrust average people into extraordinary circumstances that few could have ever imagined” It took a thrice failed businessman and turned him into a hard hitting, world class general. 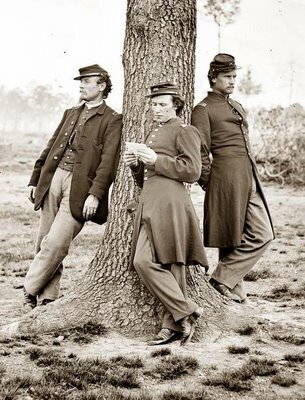 The war took a man who was an orphan from the age of 7, a man who struggled to make it through West Point and turned him into one of the most loved and reveared of all Civil War heroes. The Civil War freed 4 million men, women, and children from slavery. It strengthened us as a nation and brought us together so we could stand against others in the wars to come. It strengthened us spiritually. In times of hardship people turn to God (something that needs to happen pretty soon in modern day America). It made America what it is today. Think of the “momentous issue of Civil War” (to quote Lincoln’s first inaugural address) and all the good it did for America. 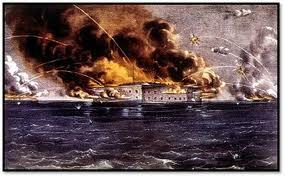 Today is the 150 anniversary of the bombardment of Fort Sumter. On April 11, 1861 Pierre Gustave Toutant Beauregard offered his ultimate to Major Robert Anderson the commander in Fort Sumter that they must surrender and evacute. Anderson refused, so in accordance with Beauregards terms the shelling of the fort began on April 12 at 4:00 AM. The bombardment lasted for 34 hours and destroyed the fort. The only casualty reported from the battle was Daniel Hough. He died while loading a cannon that was to fire in the final salute to the fort on April 14, 1861.
on April 12, 2011 at 7:05 pm Comments Off on It Has Begun! Not an actual picture of Cummins its a good representative image. I was recently given the opportunity to view a collection of over 2oo hundred letters from the Civil War sent by S. B. Cummins to his family. They were on display at the Northland International University Library. That was the first chance I’ve ever had to really get “up close and personal” with Civil War documents. Let me just take the time to say that was one of the coolest things I have ever seen or done. I was just blown away by what he wrote about; the weather, his pay, and where they were in camp. He didn’t write about blood, gore, or battle very often. He wrote about what mattered to him on a daily basis. He wrote about the things that he thought mattered to his family. He was a very down to earth kind of guy (at least thats what I gathered from his letters). He wasn’t one of those over zealous soldiers looking for glory and honor on the field of battle. He was your regular joe, run of the mill kind of guy. That struck me as so cool. It helps to personalize the Civil War and humanize it, if thats the right term to use. It brought it down to a level of personability that I think you need to have in order to get a real grasp on the Civil War.